Breville Radio Toaster makes tunes and toast | What Hi-Fi? Meet the Breville Radio Toaster, with built-in FM/AM radio, graphic equaliser, 10 presets. backlit digital display and even a line-in for connecting your iPod or MP3 player. Natch it has two slots for your toast, a defrost and reheat function and removable crumb tray. Can't help thinking the radio electronics might get a bit toasty. 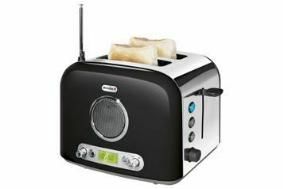 The BrevilleRadio Toaster will be available from March 1st for £50. If that's a bit silly for you, check out the View Quest Retro 1 DAB radio at £100. Its retro styling incorporates a red leather surround and handle, while an iPod dock, DAB/FM radio and battery/mains power come as standard. Both models will be available from Firebox.com from March 1st.